Chris Boget, Executive Director of the Lake Champlain Land Trust, talks about the common tern and land conservation. He tells "The WildLife" host Laurel Neme how protection of the breeding habitat of Vermont's (uncommon) common tern has made it one of the state's greatest conservation success stories. Common terns are the most widespread tern in North America yet in many states, including Vermont, they’re threatened or endangered. Habitat loss from either human activities, erosion or even gulls and other critters taking over has led to the concentration of colonies on a smaller number of suitable nesting sites. Consequently, more and more often common terns nest at marginal locations where the quality of their habitat is low and the risk of predation – from raccoons, skunks, opossums, gulls and even ants – is high. In Vermont’s Lake Champlain basin, for example, the number of common terns dropped from almost 400 nesting pairs in the 1960s to only 50 in 1988. 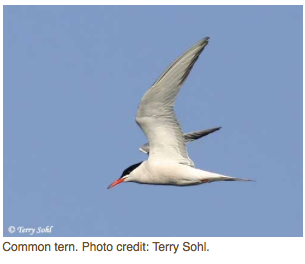 As a result, in 1989 the common tern was placed on the state of Vermont’s endangered species list. Common terns are extremely sensitive to disturbance during the breeding season. Adults will attack human intruders in the nesting colonies, often striking them on the head with their bills. The problem is that, the more they have to protect their chicks from intruders, the less time and energy they have to care for their young. 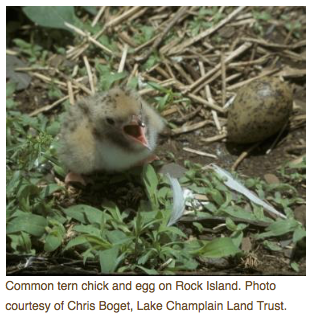 The Lake Champlain Land Trust recognized that problem early on and, since 1978, worked to permanently conserve and protect several important common tern nesting islands in Lake Champlain. It started by reaching out to the landowners of the few islands with nesting common terns and educating them about the value of the birds and the problems they face. The Lake Champlain Land Trust then led the effort to purchase and protect the only possible island habitats for terns. Through the protection of breeding habitat, along with continual monitoring and management efforts of its partners at the Vermont Department of Fish and Wildlife, Green Mountain Audubon Society and Audubon Vermont, the story of the Common Tern is now one of Vermont’s greatest wildlife conservation victories. Their numbers have soared by over 300 percent, from just 50 breeding pairs at the end of the 1980’s to close to 200 today.